The dream of every young gamer ever forced to quit playing in order to eat, do homework or go to bed has now come true – you can actually make a living as a professional gamer. According to espn.com, pro gamers now earn six-figure salaries, tournaments sell out arenas and college gaming scholarships are on the rise. The future of gaming is moving into eSports or competitive video gaming, with eGames often referred to as the Olympic equivalent for eSports. While not associated with the Olympics, at the 2016 Summer Games in Rio the British House hosted an eGames showcase featuring “Smite” as a show match and “Super Smash Bros.” for Wii U as the competition match. The first full eGames will be held during the 2018 Winter Olympics in Pyeongchang in South Korea and in 2020 at the Summer Olympics in Tokyo, Japan. Long gone are the days of holding tournaments in convention halls. eGaming tournaments are now selling out arenas globally on a regular basis, especially in South Korea. 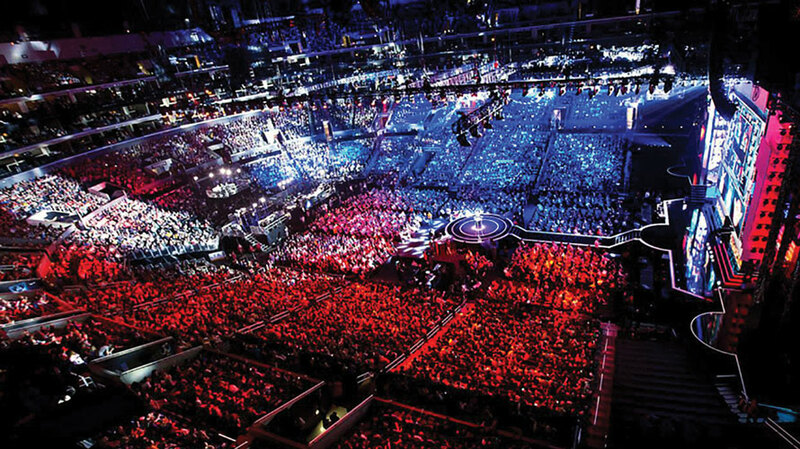 In October 2013 the “League of Legends” Season 3 World Championship final between South Korea’s SK Telecom T1 and China’s Royal Club came to the Staples Center in Los Angeles. Sold out in less than a day, the event managed to bring competitive gaming to the U.S. in a much larger way. Now incorporating eSports into its events, X Games is awarding medals to pro gamers, a decision that created an uproar among other X Games medalists. In January of last year Kristi Leskinen, a 34-year old freestyle skier who won bronze at the 2005 X Games Superpipe event, took to Twitter to protest X Games medals being awarded to pro gamers who were part of a “Halo 5” tournament. While a number of other athletes agreed with her, according to Nick Schwartz in a USA TODAY Sports “FORTHEW!N” column states that these negative opinions aren’t about to change anything at X Games. He notes that the eSports tournaments bring valued viewers to the X Games broadcasts which, surprisingly, don’t bring in high television ratings. eSports tournaments are definitely here to stay. Columbus, Ohio already has the first dedicated gaming arena thanks to Major League Gaming (MLG) with a much larger MLG facility set to open this year outside of Shanghai, China. And just last month USA Today Sports reported that the National Basketball League (NBA) Commissioner Adam Silver announced that they have a new NBA 2K eLeague partnership with Take-Two Interactive Software that “will include a wing for the video game community.” This will be the first official eSports league operated by a U.S. professional sports league. Scheduled to launch in 2018, five pro gamers will be paid a salary to play a version of the popular NBA 2K video game using user-generated avatars rather than those of NBA players. In sharp contrast to Leskinen’s opinion of gamers as non-athletes playing couch games, Silver says that gamers “… are a completely different set of professional athletes,” an opinion shared by Compete Magazine. “There’s a global pool of gamers,” Silver said. “They come in all ages, and sizes and ethnicities and sexes, and then we will at some point have a draft that will look somewhat similar to an NBA draft, in which the teams will select their players, and presumably on top of that they’ll have the ability to spot some great talent on their own, players who aren’t identified through sort of a league system. And that’s how we’ll form our teams.” At this year’s All-Star Tournament in New Orleans five NBA players were trounced by Still Trill, a team of five gamers in a runup to the eLeague’s official launch. Under Silver’s leadership virtual reality (VR) may finally reach its potential to transform the sports industry like never before. The idea of replacing a person’s senses with those generated by a computer failed to catch hold in the 1990s but better technology and more affordable equipment means it’s here to stay. NBA fans with a season LEAGUE PASS subscription can already view the league’s weekly games in VR. Starting on February 23 fans without the LEAGUE PASS can now select games a la carte to view in VR for $6.99. As if it couldn’t get any better, Silver is already talking about fans being able to pay to watch just the last five minutes of NBA games. Part two in a four part series on Video Gaming.